Police are investigating after a woman reported an attempted assault in a Blackpool park. The woman told police that she had been followed by a man in Gynn Square Park, near the Promenade, shortly after midnight on Wednesday, March 20. 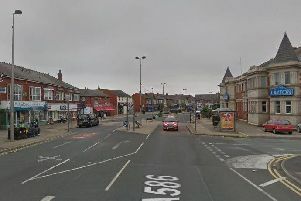 A man attempted to assault a woman in Gynn Square Park, near the Promenade, in Blackpool at around 11.50pm on Wednesday, March 20. The man allegedly tried to assault the woman, but she was able to escape and flee towards Warbreck Hill Road. The woman said she had been that frightened by the man that she ran into the road before oncoming traffic. The man fled the scene after a passing car stopped to help the woman. A police spokesman said: "We are appealing for any witnesses with any dashcam footage following an incident on March 20, 2019. "Between 11.50pm and 12.10am on Wednesday, March 20, a lone female was approached by a male in Gynn Square Park, Blackpool. "The male attempted to assault the victim who ran into the road on Warbreck Hill Road. "The victim recalls a number of cars passing by as the male followed her. "We are appealing for anyone who may have been in the area who may have any dashcam footage of the incident to come forward in an attempt to identify the male." If you have footage, please email 8093@lancashire.pnn.police.uk or call 101 quoting Crime Reference 04/58914/19.